incontro tendenza: BodyFit ® flies to Palermo! On 13.04.2013 will be in Palermo at the Sporting Village "... 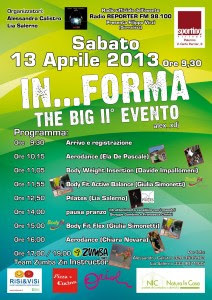 In Form", an event dedicated to the welfare of the body fitness, organized by Alessandra Calistro and Lea Salerno. A full day dedicated to the most current sports activities for welfare of human body, with many important instructors who will be on stage with various performances. Participate in the event, in addition to organizing Alessandra Calistro (Head of BodyFit ® for Sicily Region) and Lea Salerno (Pilates), also Emanuela De Pascale (Aerodance), Davide Impallomeni (Body Weight Insertion), Giulia Simonetti (BodyFit ® Active Balance - BodyFit Flex ®), Chiara Novara (Aerodance) and Francesca Chinnino and Giuseppe Gambino (Caribbean). The sporting event "... In Form",has been edited by Virginia Teresi and will be presented by journalist Philip Virzì, the music will be offered by Gianni Guttie, and finally among the many prestigious sponsors, including Radio Reporter, the official radio station of the event.